THIS IS A VERY NICE EXAMPLE OF A TAGGING ERROR. INSTEAD OF THE NORMAL TAGGING ON BOTH SIDES OF THE STAMP THERE IS ONLY ONE BAR ON THE LEFT. 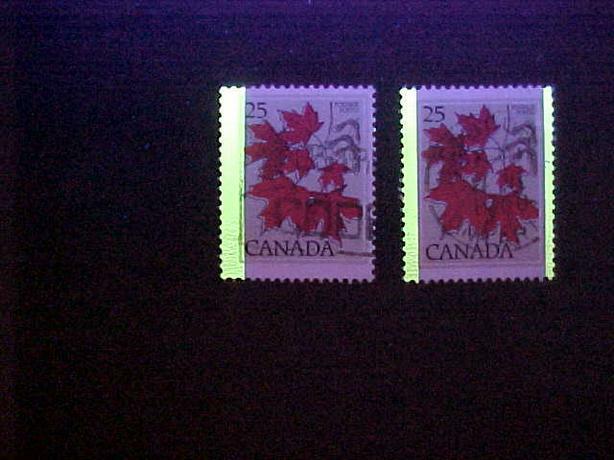 THIS OCCURRED ON SCOTT 719 THE 25 CENT SUGAR MAPLE DEFINITIVE THAT WAS ISSUED AUGUST 8, 1977. THE STAMP IS USED AND IS IN NICE CONDITION. FOR OTHER ITEMS OF PHILATELIC INTEREST ESPECIALLY ERROR STAMPS PLEASE VISIT MY OTHER ADS.